Click on the link to see what is happening this week at BBJH. Clicking on the link will take you to the newsletter for events and information for this week at BBJH. Click on the link to see what is happening this first week of April. Click on the link to see the events happening this week at BBJH. Please click on the link to see the activities going on this week. Remember, no school for students on Friday, March 8th and Spring Break is March 11-15. School will resume on March 18th. Great things are happening this week at BBJH. Click the link to see how you can participate. 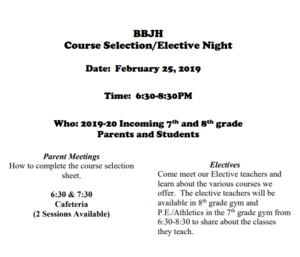 Information about course selection and electives for incoming 7th and 8th grade students. Monday, February 25, 2019 from 6:30pm-8:30pm. BBJH will have a modified bell schedule during the 3rd 9 Week DCA's. Please click on the link to see further information. We have a lot of things happening this week at BBJH and across the Magnolia district. Click on the link to see how you can be included and contribute to our community. Please click on the link to see what is happening at BBJH during the week of February 11th.